As membership in the Shriners fraternity grew in the early 1900s, so did the call for establishing an official charity. In 1919, the Imperial Potentate-elect pitched the idea of establishing a hospital to provide free care for children with orthopaedic problems. The idea was mulled over and, in 1920, a committee was established to explore the idea. This committee concluded that there shouldn’t just be one hospital; there should be a network of hospitals throughout North America that provide medical care at no charge. It was an idea that appealed to Shriners, who, as we know, like to do things in a big way. The first hospital opened in Shreveport, La., in 1922. Today, there are 22 Shriners Hospitals for Children, 18 of which specialize in orthopaedic care, treating injuries and problems of the bones, joints and muscles, as well as complicated conditions, such as brittle bone disease, spina bifida and cerebral palsy. Additionally, four hospitals specialize in providing medical care to kids with burn injuries. Shriners entered the field of burn care in the 1960s after recognizing a lack of medical expertise in the field. Shriners Hospitals treats children with acute, fresh burns; conducts reconstructive and restorative surgeries on kids with healed burns; treats children with severe scarring that limits mobility; and also helps kids with scarring or facial deformities caused by burns. 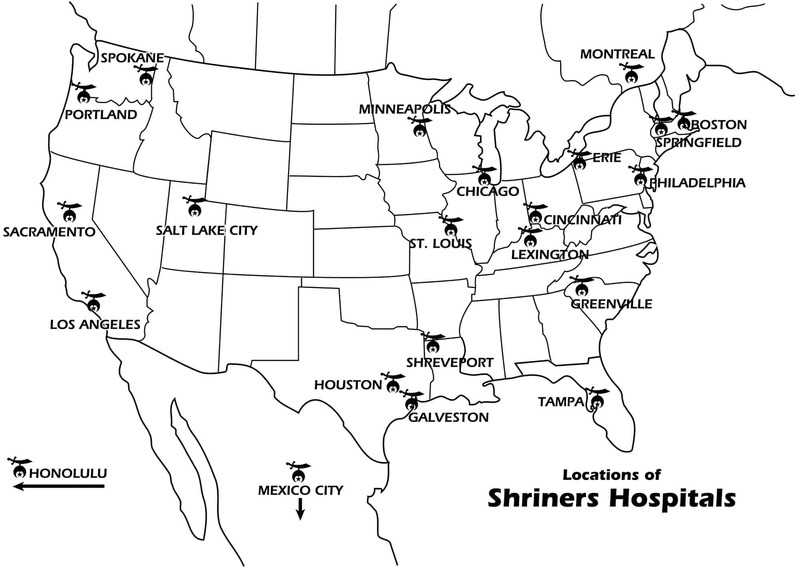 Spinal cord rehabilitation units are located within three Shriners Hospitals. These units provide long-term rehabilitation and intensive physical, occupational and recreational therapies for children with spinal cord injuries. One of the hospitals, located in Sacramento, Calif., provides care for children with orthopaedic conditions, burns and spinal cord injuries. Moreover, Shriners Hospitals for Children established a cleft lip and palate program in 2005. This program provides lip and palate repair, nasal reconstruction, facial work and dental procedures, as well as audiological, speech and psychological services. “Today’s research is tomorrow’s patient care” is a well-known saying at Shriners Hospitals. In 2007, $37 million was budgeted for research projects. Since Shriners Hospitals began a formal research program more than 40 years ago, more than $515 million has been invested in research projects. While eight Shriners Hospitals are specifically designated as research centers of excellence, all 22 Shriners Hospitals for Children are involved in some form of research. Shriners Hospitals have research affiliations with major universities. Generally, these investigations focus on improving and expanding treatments for severe burns, understanding complex musculoskeletal disorders, and improving techniques used to treat both mobility problems and spinal cord injuries. Shriners Hospitals take an active role in medical education. Over the past 20 years, more than 8,000 physicians have received residency education or postgraduate fellowship education at Shriners Hospitals. Most of our hospitals have residency or teaching affiliations with other hospitals or universities. Shriners Hospitals also provide training in other medical areas, including nursing, physical and occupational therapy, and orthotics and prosthetics. While there are many elements to Shriners Hospitals for Children, there is only one purpose: to improve the lives of children. The total budget for the 22 Shriners Hospitals is $721 million in 2007, but that money doesn’t come from the pockets of patients or their families. Thanks to the generosity of the Shriners and the general public, ability to pay or insurance coverage is never an issue. All care at Shriners Hospitals is provided at absolutely no charge to the patient, family or legal guardian. The hospitals are substantially funded through the Shriners Hospitals for Children endowment fund, maintained through gifts, bequests and contributions. Additional income is provided by an annual hospital assessment paid by every Shriner, as well as fundraising events. 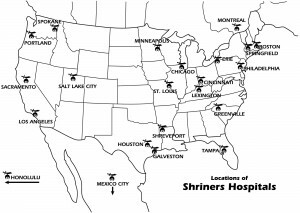 Admission to a Shriners Hospital is based on medical need. All children, up to the age of 18, are eligible for admission if they can benefit from the specialized services available at Shriners Hospitals. Application forms are available from your local Shriners, online at Shriners Hospitals for Children or by calling toll-free (800) 237-5055 in the U.S. or (800) 361-7256 in Canada. Shriners Hospitals for Children needs your help! Learn more about making a one-time gift, recurring gift, or a planned gift by visiting http://www.shrinershospitalsforchildren.org or by calling us at (800) 241-GIFT. 909 S. Fair Oaks Ave.
2211 N. Oak Park Ave.
3101 S.W. Sam Jackson Park Rd. Fairfax Rd. at Virginia St.